PRODUCTION of coated paper at the Boyer mill near New Norfolk will start in April, Norske Skog president and CEO Sven Ombudstvedt says in the company's annual general report. "Instead of closing a newsprint machine, $84 million has been invested in a new winder/coater. This means that, for the first time, we can supply something other than newsprint from own production in Oceania," Mr Ombudstvedt said. "Following the conversion, Norske Skog will cover Australia’s demand for glossy paper for catalogues and magazines." The conversion of paper machine two (PM2) at Boyer has been supported by government grants totalling $28 million and a loan of $13 million. "We are very grateful for the generosity that the Australian authorities have shown in the financing of these projects. The results of these large investments will improve the quality of the paper and contribute to lower consumption of raw materials," Mr Ombudstvedt said. conversion from newsprint to magazine paper. Photo: Mark Hutchinson/Norske Skog Annual Report 2013. 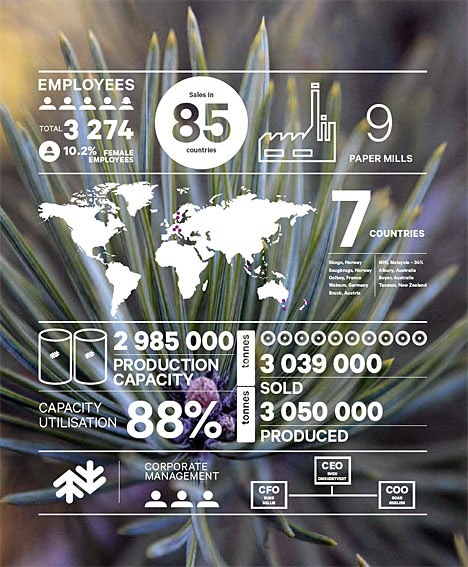 In 2012 Norske Skog announced the conversion of one of the Boyer Mill’s two newsprint machines to the production of lightweight coated (LWC) paper. 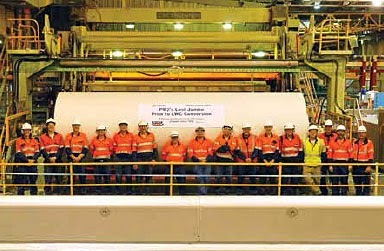 The $85 million project is part of a broader regional strategy aimed at transforming the business from being wholly a newsprint producer to having a more diverse future in paper, fibre and energy. The machine was shut down in December 2013 to enable the cutover to the new equipment. The new product, to be marketed under the brand "Vantage LWC", is aimed at the domestic Australian market which uses 300,000 tonnes of catalogue paper annually, all of which is imported. Norske Skog's marketing and sales division has been working closely with local printers and their customers who are keen to see the establishment of a secure local supply of magazine and catalogue paper. The conversion project has involved adding coating and gloss-enhancing equipment capacity to one of Boyer's two existing paper machines and extending the current building to house the new equipment. There has been a vast array of equipment upgrades and process changes to ensure the final product meets the high quality specifications and printing performance demanded by the market. Test-runs are believed to be well under way. The project has also been well supported by the network within Norske Skog globally. Norske Skog Bruck in Austria has aided with the development of the coating formulation and a decommissioned bleach plant from Norske Skog Follum in Norway has been reused at Boyer. The annual report notes that Norske Skog Boyer had 300 employees at end of December 2013, with an average age of 47 years and average length of service of 21.3 years. An infographic showing Norske Skog's global extent in 2013.